Make the Marinara Sauce: Heat the olive oil in a pot. Add the onion and sauté over medium heat until translucent, 5 to 10 minutes. Add the garlic and cook for 1 more minute. Add the wine and cook on high heat, scraping up all the brown bits in the pan, until almost all the liquid evaporates, about 3 minutes. Stir in the tomatoes, parsley, salt, and pepper. Cover, and simmer on the lowest heat for 15 minutes. Bring a large pot of water to a boil for the pasta. Cut the bacon into 1-inch pieces and place into the bowl of a food processor. Pulse the bacon until it is evenly ground and no large chunks of bacon remain. In a large bowl combine the bacon with the remaining ingredients. Mix gently until evenly combined (NOTE: Overworking the meats will result in tough meatballs, don’t over-mix or compress the meatballs too much). Scoop the meatballs into 1½-inch balls, making sure not to compress the balls while shaping. Place on a parchment lined pan and chill, uncovered, for at least two hours. Heat the oven to 200°C. Once the meatballs are chilled heat a non-stick skillet over medium heat. Working in batches, add the meatballs and brown thoroughly on all sides. Transfer to a baking sheet until the rest of the meatballs are browned. 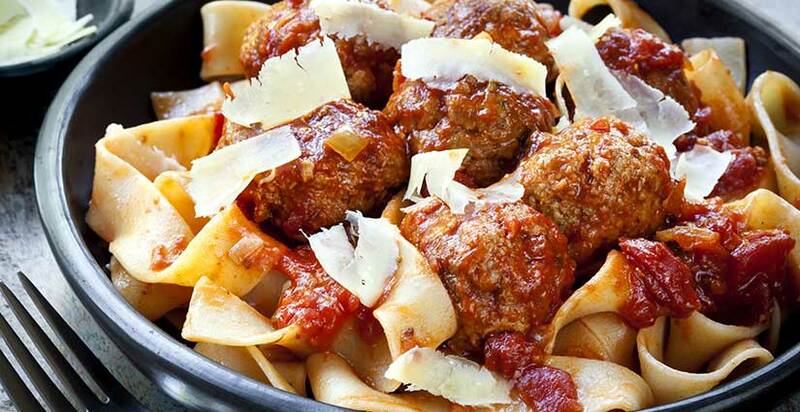 Bake the meatballs for about 10 to 15 minutes. Heat the marinara sauce over medium heat, 2 to 3 minutes; add the meatballs and toss gently to coat. Serve over the pasta with the shaved Parmesan.